Facundo Ferreyra scored for Newcastle United Reserves last night, his first for the club, to give Alan Pardew a welcome boost as his search for another striker continues. If the transfer window closes without any more business being conducted, the Newcastle manager needs all his centre-forwards in form, and competing for a place in the first-team, if his side is to progress in the manner and style he would hope. Ferreyra grabbed his goal in a second-team match at Bolton, which finished 3-3 – good news as the Argentine can’t wait too long to get up to speed with the English game. He didn’t make the bench for the Manchester City game, but a goal even in a reserve match might get the on-loan man a place in the squad for Aston Villa on Saturday. With Papiss Cisse still some way from being back to full fitness, and even then there are understandable doubts over his goalscoring ability, Pardew only has Emmanuel Riviere and Ayoze Perez as his other would-be goal scorers – although Yoan Guoffran can play that role. Loic Remy is now almost certainly a no-goer as Harry Redknapp insisted the Frenchman is going to stay at QPR and had knocked back Newcastle. We are now in the strange situation where Remy would prefer to stay at QPR rather than come back to St James’ Park. Pardew says he would be happy to go past the end of August with the squad he has, but privately he would admit one more top-class centre-forward would be more than welcome. However, he has been pleased with the form of Perez, the 21-year-old signing from Tenerife, who has shown himself to be far more than just a squad player. The Spaniard almost scored against City within seconds of making his Newcastle debut as a second-half substitute and his manager believes the young man has a real chance of making a serious impact over the coming months. 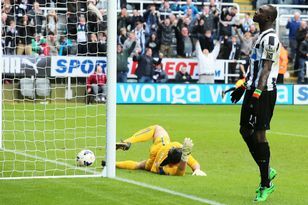 Pardew said: “I have been impressed with him pre-season. Since being with us he must have grown a centimetre in his body, also in muscle mass. “He has fantastic technique though and he didn’t really do much wrong with that chance. “He created a little chance and it was only an unbelievable recovery tackle that stopped him scoring. “He has a lovely manner to him and we have high hopes for him. “I think he will play a part this season. How significant we’ll have to wait and see.” Pardew still believes his side can be a threat offensively and he will need to see that at Aston Villa this Saturday. He said: “We’re still missing Papiss and Siem de Jong, two massive players for us we’ve paid a financial outlay on.